Added by Bill Bowman on January 15, 2019. Andrew Terhune, a member of Boy Scout Troop 113, describes his Eagle Project to the Open Space Advisory Committee. 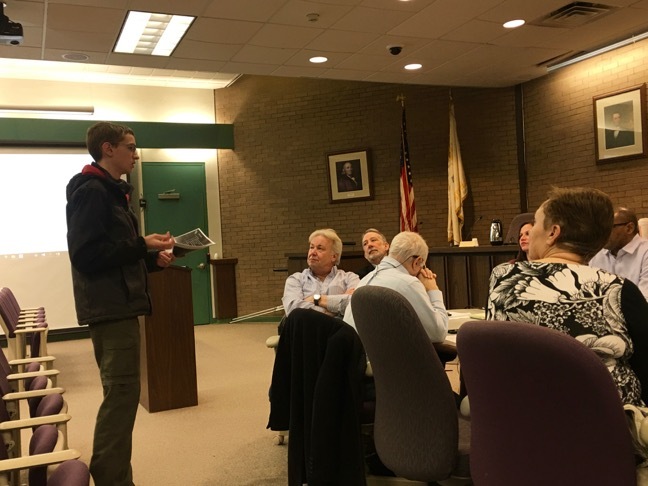 A Boy Scout’s plan to build and install mini-libraries in three township parks was given a thumbs-up Jan. 15 by the Open Space Advisory Committee. The scout, Andrew Terhune of Boy Scout Troop 113, wants to build the mini-libraries as his Eagle Scout project. He told the committee that he has targeted Middlebush, Harvey J. Inman and Naaman Williams parks for the project. Mini-libraries, also called Little Free Libraries, go on the premise of “take a book, leave a book.” They are basically boxes with clear glass or plexiglass doors mounted on poles, in which a number of books are stored. The designs range from the very simple to the very ornate. There are more than 75,000 such mini libraries around the world, according to the web site. There are several mini-libraries in the township, including one in East Millstone on the side of the Sunrise Creek Deli on Main Street, one in Kingston on Sycamore Place, and one in the prayer garden at Saint Matthias Church on John F. Kennedy Boulevard. Terhune said his libraries would be boxes about two feet tall, mounted on five-foot-tall poles. The doors would be made of plexiglass and latched to keep out the weather. “They look like little birdhouses with a door,” he said. Terhune said he was looking to the committee for support for his idea, and for materials. “This is a similar approach to the project that the grad student did in Negri Nepote with the bird-watching informational signs there,” Township Manager Robert Vornlocker told the committee. Vornlocker was referring to a project done by graduate student Ahmed Awadallah, who installed about two dozen bird-watching information stations at the Negri-Nepote Grassland Preserve. “We can certainly have the public works department provide the materials that this young man needs to put this together,” he said. Vornlocker said the Public Works Department would purchase the materials Terhune needs, then assist him with installing the libraries when they’re constructed. Terhune said he’d like to start the project in the spring, with an eye toward completing it in the summer. He first has to get approval from his Troop Committee, then approval from the BSA’s Patriots’ Path Council. Terhune will work with Tara Kenyan, the township’s open space consultant, on placement of the libraries. They should be placed “by the activity centers of these parks, and each of the three parks you named have activity centers that are centered around pavilions, benches and picnic areas,” he said. “Can we do this for him to do these three, with an option to do three more?” committee member Arnie Schmidt asked. “We have 22 municipal open space and recreation properties, so maybe we want one on every one, right Arnie?” Vornlocker responded.